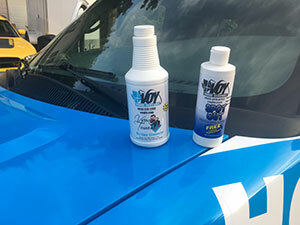 A personalized bottle of spotting solution is one of the best and most effective marketing tools for carpet cleaning companies. Compare it to other marketing giveaways you may be using: pens, magnets, or wallet-sized calendars. These are common items that are easily misplaced or even discarded. A bottle of spotting solution, however, will get safely tucked away in the cupboard and used over and over again. Just imagine… within a few weeks or days of having her carpet cleaned, your customer will invariably spill something. Imagine the frustration that she feels when standing over that spill on the freshly cleaned carpet. What if you could provide that “little extra something” that will make her life easier and help her remember your business from now on? What if that “little extra something” was a bottle of spotting solution that you gave her before you left her home? What if, as she stood over the stain reading the directions on the bottle, she also saw your business’s name and contact information on the bottle? What if she saw your company’s name every time she took out that bottle of spotter? So, when the time comes for the next service call, it will be YOUR NAME she remembers. When friends and family ask if she knows a good carpet cleaner, YOUR NAME will be the first that comes to mind. The power of this small giveaway item is truly incredible. Plus, these personalized bottles of spotting solution come at a price that fits anyone's budget! There are no big quantity commitments. Just a 4-case minimum order (48 bottles) per label design will get you started! "The other day my tech did a job for a realtor we are trying to turn into a cheerleader. He is a property manager for about 50 rentals in our target market area. We priced the job at our $150 minimum for 4 rooms about 600 sq ft in a 2600 sq ft home. Not a big money job. We did the job on a Friday the realtor was pleased and our goal of starting get his referral business was accomplished. "As is our practice, my tech left a bottle of spotter and a business card on the kitchen island. Fast forward to the next Wednesday night. I came in the office to check my email and a contact form had been sent from our web site. The customer said to call anytime up to 9:00pm. It was 8:30pm, so I called him. He had picked up our spotter when he got possession of the house was disappointed the realtor had not cleaned 8 other rooms. He liked what we had done and contacted us. I priced him out at $280 for the other rooms. Set up to clean the house the next afternoon. The spotter took a $150 job and turned it into a $430 job!" Second job this week I've booked after giving someone at my networking events a bottle of my lifetime spotter. I'd say it's a great investment! !